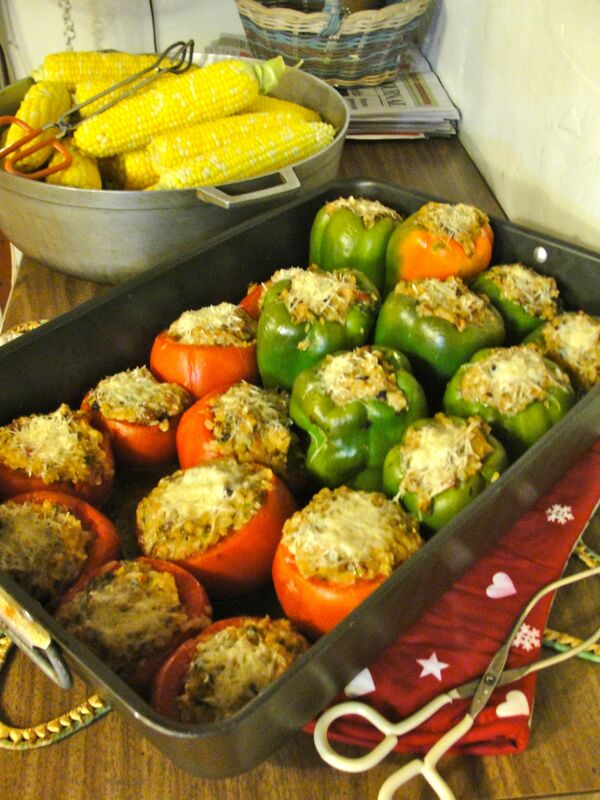 Stuffed Tomatoes and Peppers for 18 people! So after a bit of a posting hiatus, I’m back… life got busy, mostly with fun stuff, so I haven’t been cooking a lot of new things, but I did find some interesting cooking situations, so here goes. My girlfriend recently moved into a co-op house with 14 residents in total. 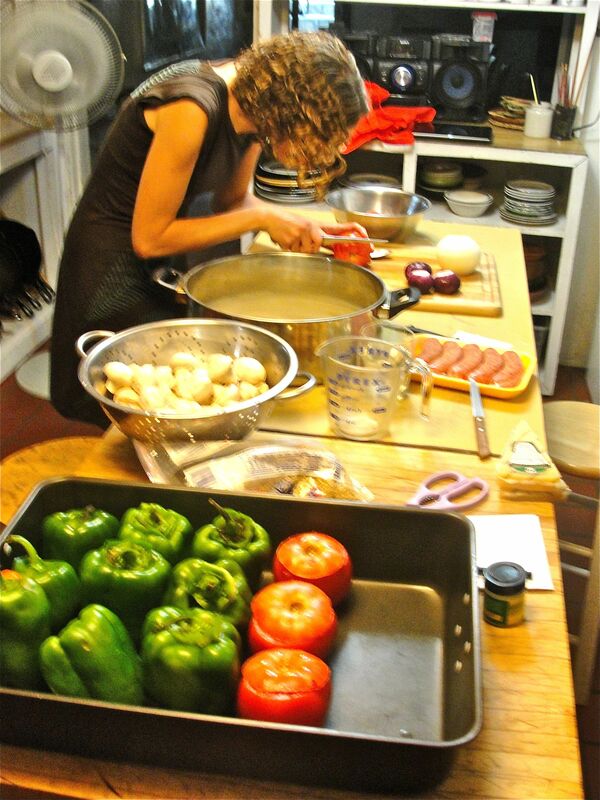 While the house doesn’t share all their food, as some co-ops do, huge dinners are prepared to eat communally; every resident signs-up for nights to make dinner for everyone, and this happens nearly every single day! Whomever is making a dinner also typically invites other guests of their own. So, for this first dinner, we were preparing for 18 people! That’s definitely the biggest sit-down home meal I’ve ever participated in preparing. At the co-op house, appropriately, a lot of the cooking vessels are king-sized. 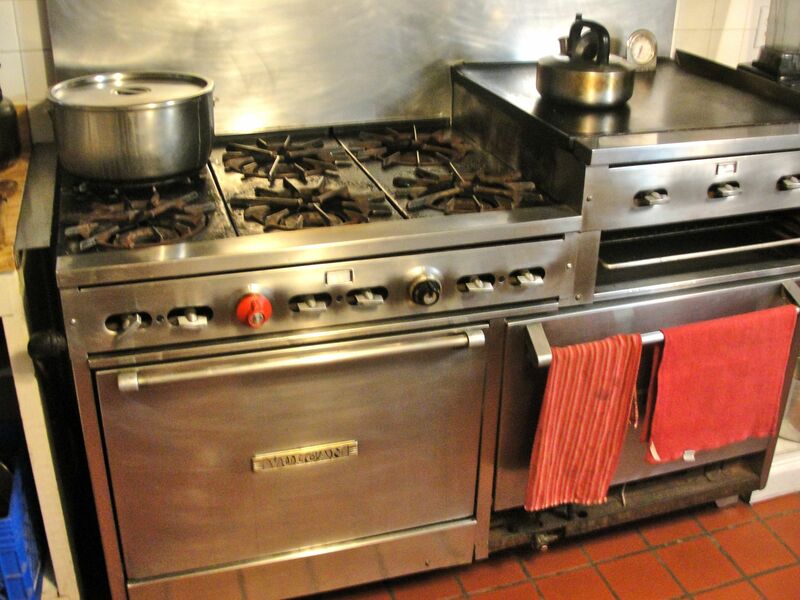 And, an advantage is one gets to cook on this huge Viking gas range! The co-op’s huge Viking gas range. Hours of prep, prep, and more prep! The peppers (selected for large size, and so they could stand upright) and tomatoes were cored and packed in baking pans (lightly greased with olive oil). Hollowed-out peppers and tomoatoes; italian sausage for stuffing. 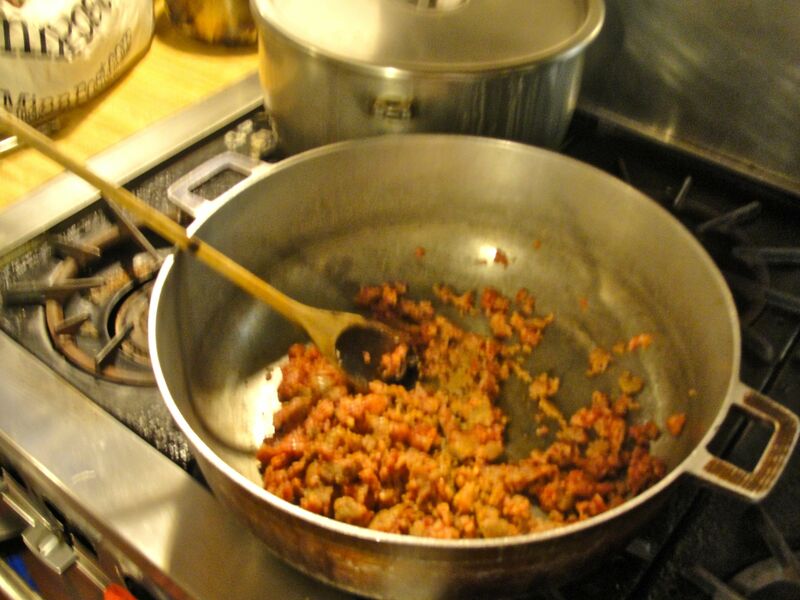 The stuffing ingredients were mixed and lightly cooked with the sausage after browning. 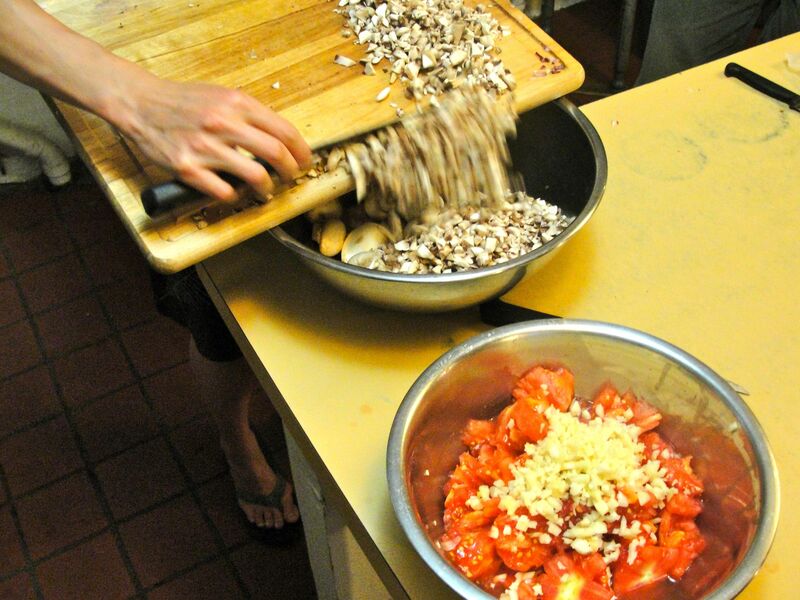 Chopped mushroom for the filling; also, tomatoes and minced garlic. A relatively small amount of sausage was used (5 sausages for 18 total servings), and browned in a large pan. 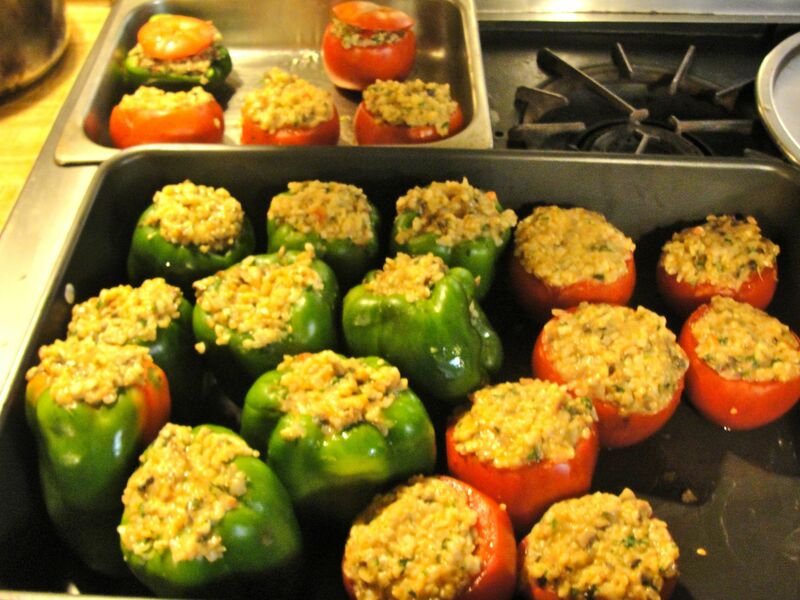 Once the filling was mixed together with the cooked brown rice and seasoned to taste, the peppers and tomatoes were filled. We also made some vegetarian only filling, substituting some more cheese instead of the sausage, and we were careful to keep track of which were the vegetarian ones. Stuffed and ready for the oven. 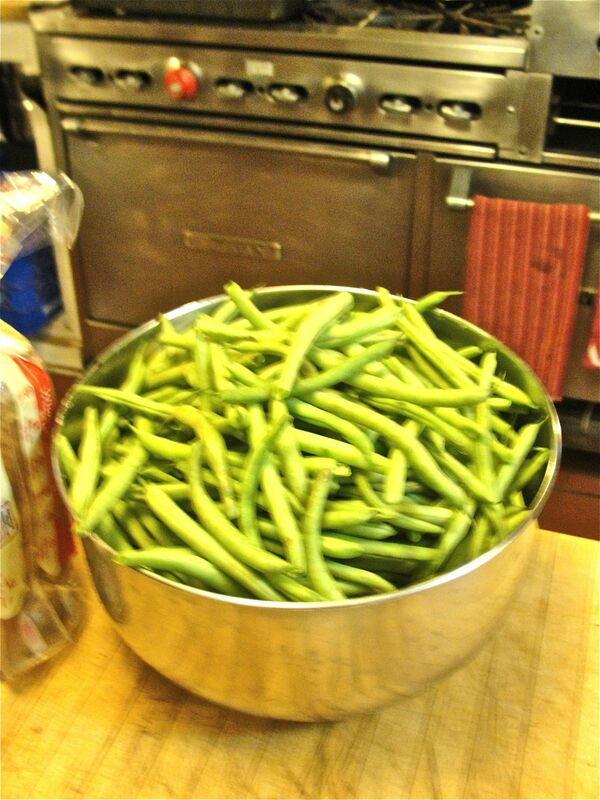 For a side, we washed and trimmed 3-4 pounds of fresh green beans. 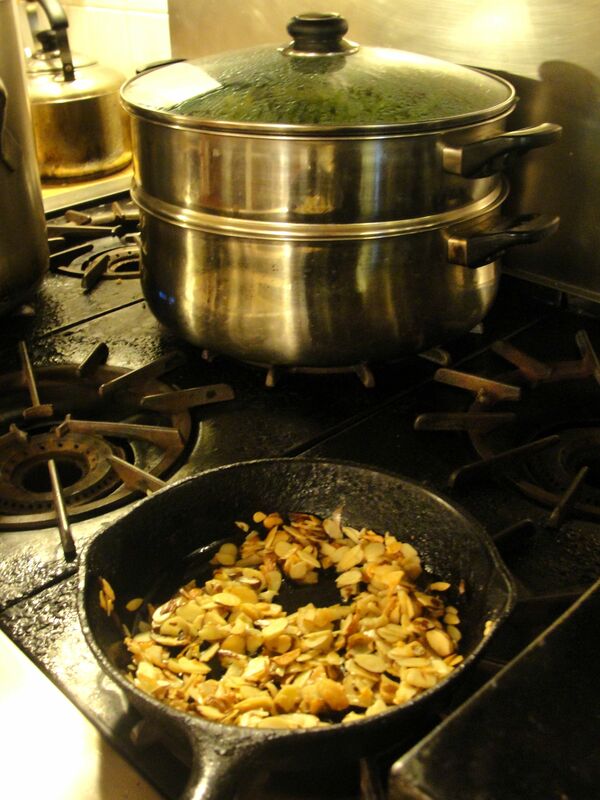 The green beans were steamed while sliced almonds and garlic were sauteed in oil. Toasting/browning sliced almonds in olive oil with garlic. Humongous steamers are great for preparing the vegetables, and the range top with so many gas burners allows many things to be going at once. 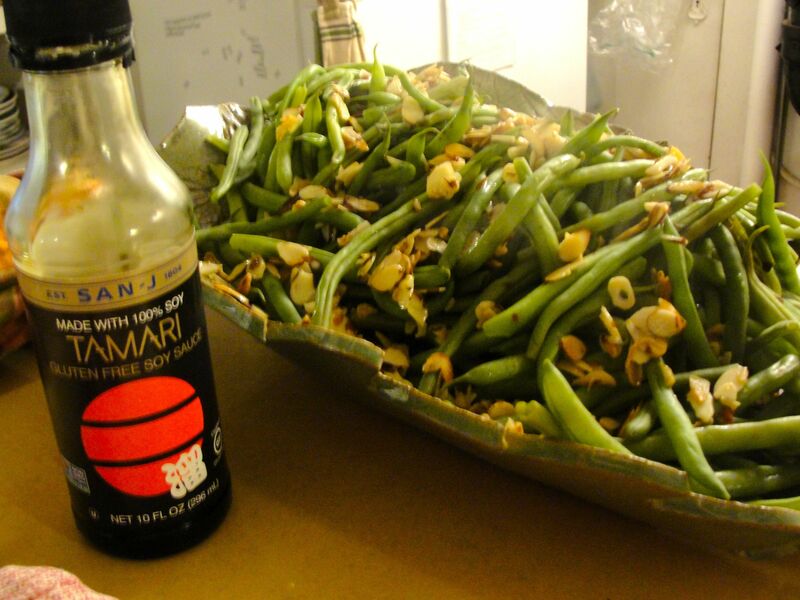 Green beans with garlic, almond, and soy sauce. 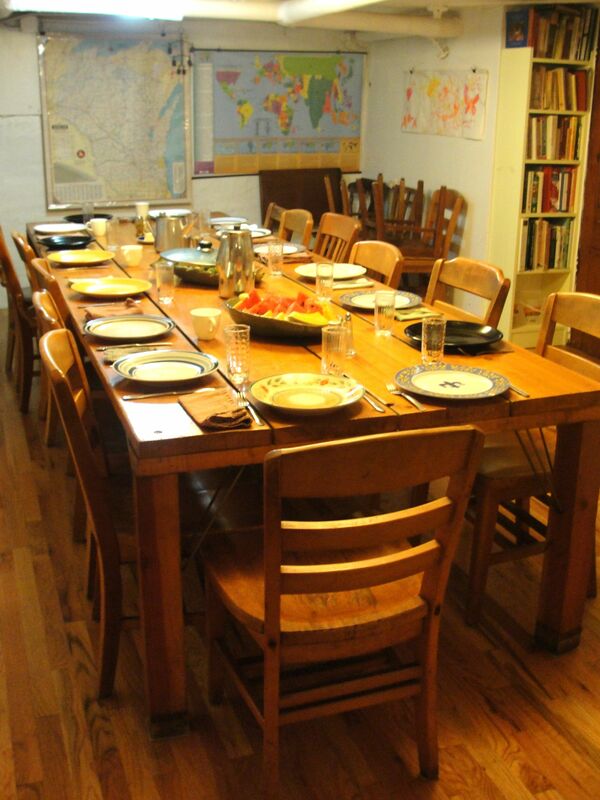 The co-op has a large dining room with a great table, here set for 17 residents and guests! Two kinds of sliced melon were also served with the dinner. The co-op’s dining room table, awaiting the dinner bell. For those residents don’t make it for dinner, the leftovers are packed individually for each of them and left in their respective refrigerators. Food prep takes a long time; in total we took over 4 hours to prepare this meal. We’ll get better at using the food processor for chopping. 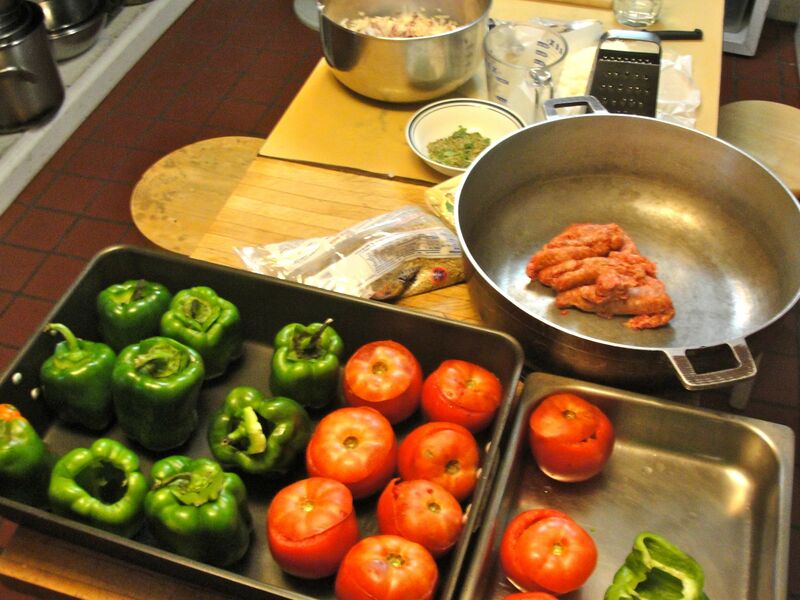 Adding spices for very large dishes takes practice… I kept having to add, taste, add, taste, add, add, add! Easy summer foods like sweet corn on the cob and watermelons are great side dishes. 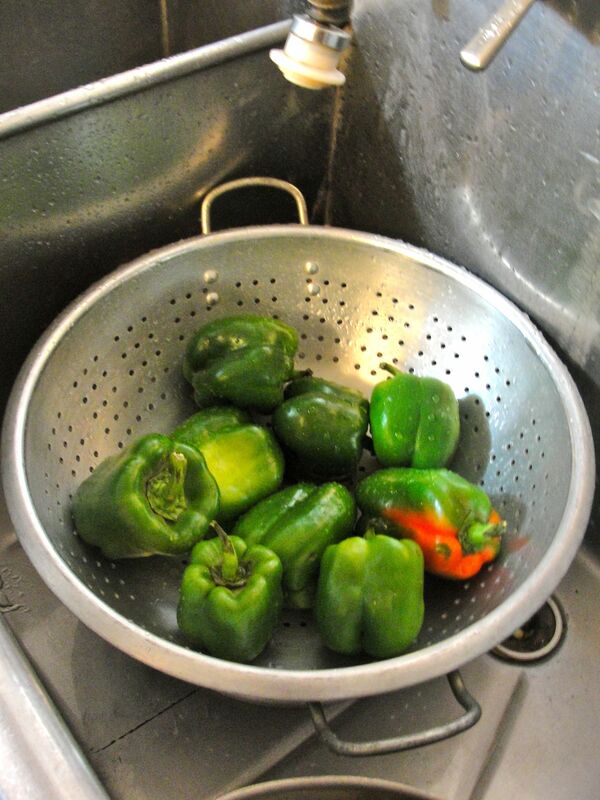 The hollowed-out bell peppers can be blanched and partially cooked in boiling water before stuffing them, so that they cook in much less time, similarly to the time for the tomatoes. A large group makes for quite the convivial kitchen and dinnertime. Based on the ingredients, these seem a lot like my mom used to make. Great meal for a large party!